Nominations for the presidential election closed at noon today, September 28th. 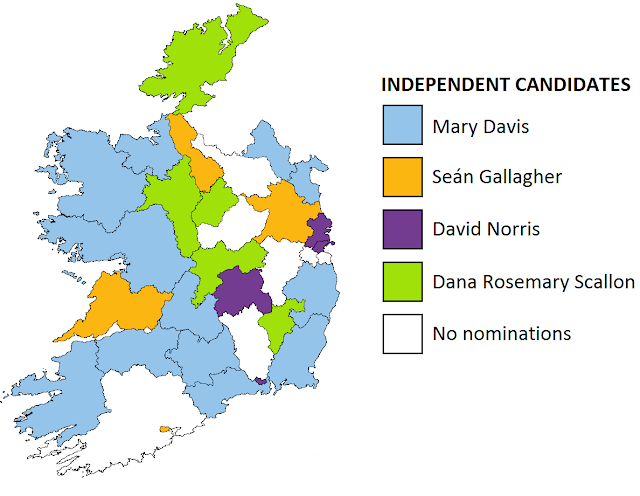 After a dramatic week of last minute efforts by Senator David Norris and former MEP Dana Rosemary Scallon, the 2011 presidential election now boasts a record number of seven candidates, four of whom are independent candidates. Gay Mitchell (Fine Gael), Michael D. Higgins (Labour) and Martin McGuiness (Sinn Féin, though running as an independent) each secured their nominations through their respective parties in the Oireachtas. Prospective Independent candidates had to rely on gaining the support of 20 Oireachtas members or 4 local councils. Businessman Seán Gallagher and disabilities campaigner Mary Davis each achieved their nominations in early September through the backing of local councils. After receiving the backing of the necessary four councils, Gallagher requested that other councils remove his name for consideration in favour of other applicants. Davis did not make such a request, and had therefore won the support of 13 councils by the time the deadline passed. Senator Norris, after a tumultuous campaign that saw him go from being the frontrunner to bowing out of the race to re-entering it once more, was on the cusp of gaining 20 Oireachtas signatures when the decision by Independent TD Mattie McGrath not to support his bid meant he had to turn to the councils. He secured the backing of Fingal and Laois, before going on to win Waterford and Dublin City at the eleventh hour. 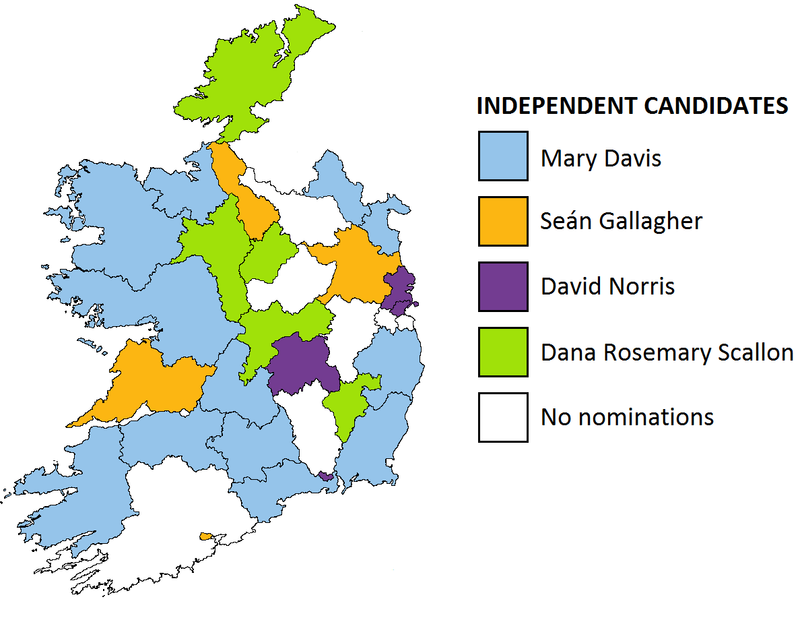 Simultaneously, Dana Rosemary Scallon (who had come third with 13.8% in the previous presidential election) entered the race at a late stage and easily secured the backing of councils in Leinster, Connacht and her native Ulster. Below is a map showing the local councils and the candidates they backed. Cork, Kilkenny, Kildare, Westmeath, Cavan, South Dublin and Dún Laoghaire-Rathdown each refrained from nominating a candidate.